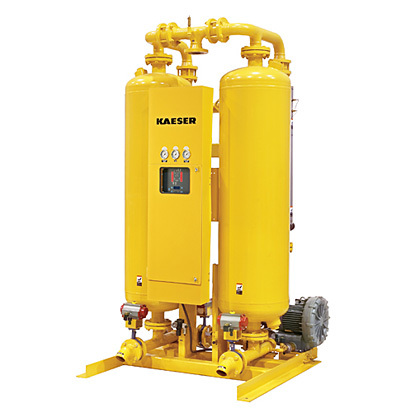 Kaeser externally heat-regenerative blower purge desiccant dryers produce dew points as low as -40°F. Twin desiccant beds of activated alumina alternate between drying and regenerating, with regeneration being accomplished with heated ambient air at just above atmospheric pressure. The heated ambient air readily drives adsorbed moisture off of the desiccant preparing the it for another adsorption cycle. The moisture-laden regeneration air exhausts to atmosphere during the regeneration process. KBD dryers can regenerate with little (about 1%) or no process (purge) air loss.